Clinically proven as effective as string floss and easier to use. 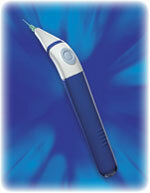 10,000 gentle strokes per minute remove plaque above and below the gumline. Comes with 15 replacement tips. Flexible nylon tip slips easily between teeth and is gentle enough on gums to use every day.